Men is an ancient Egyptian game from the Old Kingdom. Its rules are unknown, although it appears to be a game of both luck and strategy. After the end of the Old Kingdom, Men fell out of use, and was replaced by other, seemingly more popular games, such as Senet, Aseb, and Mehen. Not one whole gaming board of Men has been found archaeologically. 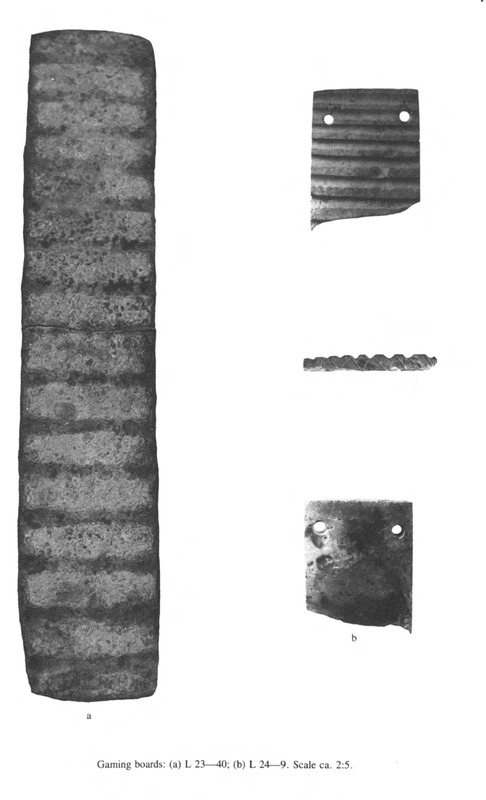 Only a few fragments, the largest having 13 out of 16 total lines, all from the Royal Cemetery at Qustul, Nubia, Egypt. Besides the physical boards, there is a depiction of Men on a painting in the Tomb of Hesy in Saqqara, which shows us an exact set of Men, with playing pieces and board, shown next to similar sets of Senet and Mehen. From this drawing we can see that Men was played with 5 small white square pieces and 5 larger black rectangular pieces. 3 Games – Mehen (Left Center), Senet (Upper Right), and Men (Lower Right) from The Tomb of Hesy, Saqqara, Egypt. Drawing by James Edward Quibell, 1913. From Quibell, James Edward. Excavations at Saqqara: 1911-1912. Institut Français d’Archéologie Orientale, 1913. Plate XI. Since both, the playing pieces, one side being small and one side being large, and the board itself, one side starting with a wide line and one side starting with a narrow line, are asymmetric, it is implied that Men was an asymmetric game, meaning that each player either had a different winning goal or a different method of capture. We can assume that Men utilized 4 throwing sticks for dice, since we know that both Mehen and Senet used the same sticks, although only 1 set of sticks is displayed on the painting, next to Senet. Men Game Board from the Royal Cemetery at Qustul, Nubia Egypt. Tomb L-23. Drawing from Williams, Bruce, and Keith Cedric Seele. The A-Group royal cemetery at Qustul: cemetery L. Vol. 3. Oriental Institute of the University of Chicago, 1986. p. 130, pl 66. Men Game Board from the Royal Cemetery at Qustul, Nubia Egypt. Tomb L-23. Photo from Williams, Bruce, and Keith Cedric Seele. The A-Group royal cemetery at Qustul: cemetery L. Vol. 3. Oriental Institute of the University of Chicago, 1986. p. 130, pl 67. 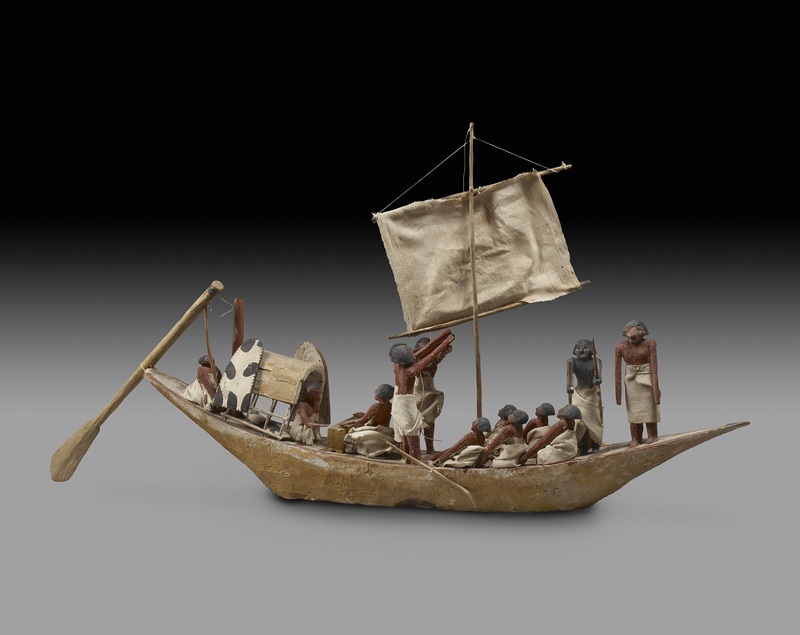 The only other depiction of the game of Men, is on a model of a war boat from the Old Kingdom, displayed in the Ashmolean Museum (E2301), where two of the sailors can be seen sitting at a table and playing Men. The way we know that they are playing Men and not some other game, is because on the game board there are 8 vertical lines, which seems to be a schematic representation of the 16 vertical lines on the actual Men board. One of the sailors is holding out his hand as if he is throwing the sticks. Model of a War Boat. From the Tomb of Nefwa at Beni Hasan, Egypt. IXth – XIth Dynasty (c. 2125 – c. 1940 BC). Note, two sailors are sitting at a table playing the game of Men, which can be identified by vertical lines going across the gaming board. Ashmolean Museum, E2301. Closeup of two sailors playing the game of Men, which can be identified by vertical lines going across the gaming board. From the Tomb of Nefwa at Beni Hasan, Egypt. IXth – XIth Dynasty (c. 2125 – c. 1940 BC). Ashmolean Museum, E2301. Photo: Rex Harris, December 15, 2009. As far as I am aware there have never been any attempts made to recreate the rules of Men prior to this one. I have attempted to come up with a plausible set of rules based on the look of the board and the pieces, and what we know about other similar games. I am proposing two different sets of rules, until they are played enough by people and worked out. My asymmetric set of rules for Men is based on a similar ancient Central American, Mayan, game called Puluc, also known as Bul. This game is still played today by the Kekchi Mayans in Guatemala and Belize. It has a similar board of corn stock stripes, the number of which varies, uses 4 throwing sticks for dice, and uses corn as playing pieces. However, Puluc is a symmetric game, where both sides are equal. Men is a 2 player game. 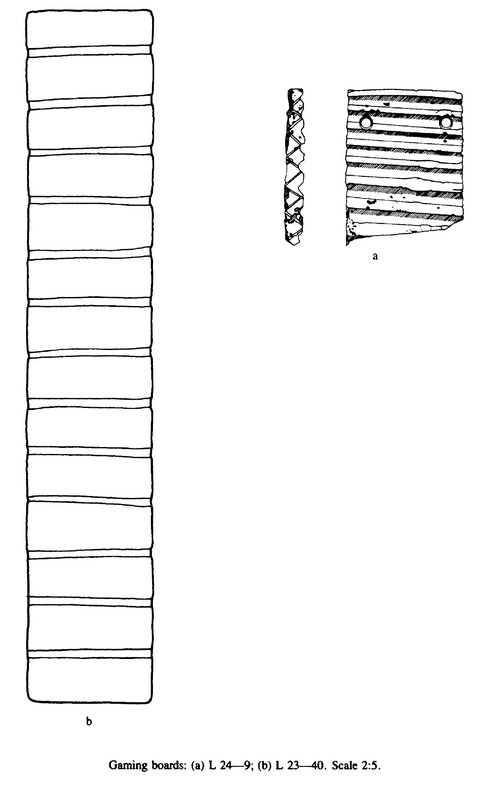 It consists of a rectangular playing board with 16, evenly spaced, vertical narrow lines, and 16 evenly spaced wide lines. One side of the board starts with a wide line and the other side of the board starts with a narrow line. 4 throwing sticks with one side flat and the other side rounded are used as dice. There are 10 playing pieces, 5 per player, 5 small square white pieces and 5 large (double in size) rectangular black pieces. The white start at the end of the board which begins with the narrow line. The black start at the end of the board which begins with the wide line. The pieces move only on narrow lines, from line to line. The game starts with all of the pieces located off the board. If one throwing stick landed on the flat side and the other three landed on the round side the score is 1. If two throwing sticks landed on the flat side and the other two landed on the round side the score is 2. If three throwing sticks landed on the flat side and the fourth one landed on the round side the score is 3. If all four throwing sticks landed on the flat side the score is 4. If all four throwing sticks landed on the rounded side the score is 5, which is the maximum obtainable score. The goals of each player are different. The white try to capture black pieces by stacking 2 small white pieces on top of 1 large black piece. The black try to capture white pieces by stacking 1 large black piece on top of 2 small white pieces. When a player’s piece moves off the board at the opposite end the player scores 1 point for every piece moved off the board. When a player captures the opponent’s piece they get 2 points for every opponent’s piece captured. It is easier for white to capture 1 black piece using 2 white pieces, than it is for the black to capture 2 white pieces using 1 black piece. For this reason, when 1 black piece captures 2 white pieces, the black side gets 2 points, where as when the white side captures 1 black piece using 2 white pieces, they get only 1 point. Players can land multiple pieces, both on top of their own pieces or on top of the opponent’s pieces on the same line and stack them. The piece at the top of the stack controls what happens to the stack. If the player lands on top of only their own pieces, they continue to move as a stack together towards the opposite end of the board. If the player lands on top of the opponent’s piece, and the opponent’s piece does not get captured, then the stack reverses direction and continues to move towards the opposite end of the board away from the player whose piece is on top of the stack. If 2 white pieces land directly on top of a black piece, whether it is in a stack or not, then the black piece gets captured and removed from the game into its captor’s scoring pile. If 1 black piece lands directly on top of 2 white pieces in a stack directly on top of each other, then both white pieces get captured and removed from the game into their captor’s scoring pile. Pieces that are separated in the stack by opponent’s pieces do not combine together and therefore do not get captured. For example, if there is a stack of 4 pieces, white on top of black, on top of white, on top of black, and then a fifth white piece lands on top of this stack then it will capture the black piece which is 3rd in the stack, but not the black piece which is at the bottom of the stack. The 3rd black piece will get removed from the game and the remaining 4 pieces will stay in the stack in the same sequence, 3 white pieces on top of 1 black piece. The stack will continue to move in the direction of the white pieces, because it is being controlled by the white piece at the top. Another example. If the black side lands on top of 4 white pieces, then the top 2 white pieces will get captured and the the bottom 2 white pieces will remain in the stack and continue moving in the black’s direction. If a player captures the opponent’s piece or pieces they get a second turn. If a player’s piece reaches the opposite end of the board it exits the game and goes in to that player’s scoring pile. If a stack reaches the end of the board, then all of the player’s pieces who was controlling that stack finish the game and go in their scoring pile, where as all of the opponents pieces go back to the beginning of the game on their starting side. The game is over when either one player captures all of their opponent’s pieces, or removes all of their own pieces off the board. However, the winner is the one who scores most points at the end of the game, not the one who finishes first. Men is a game of chance since it has dice, but still has a lot of strategy. Since the players use 4 throwing sticks as their dice, instead of a single 6 sided cubic dice, this creates some strategical options. The throwing sticks have uneven probability for different scores, as compared to a six sided cubical dice, which makes them more frustrating and exciting at the same time. The most frequent dice score on throwing sticks is 2 (probability is 6/16). The next most frequent dice scores are 1 and 3 (probability is 4/16). The least frequent dice scores are 4 and 5 (probability is 1/16). Due to this uneven probability of scoring it is advantageous to the player to keep gaps between theirs and opponent’s pieces such that they can capture one or two of the opponent’s pieces either in a single or two consecutive moves. Another point to note is that it is not always advantageous for the player to move off their own pieces off the board first, because it might not allow them to capture subsequent opponent’s pieces since they will not have the right combination of pieces necessary for the capture. Stacking your own pieces is a double edged sword. It makes them more vulnerable to the opponents capture or return to the beginning of the game, but at the same time it is necessary for the white to stack two of their pieces to capture one black piece. My symmetric set of rules is based on the rules for Senet. 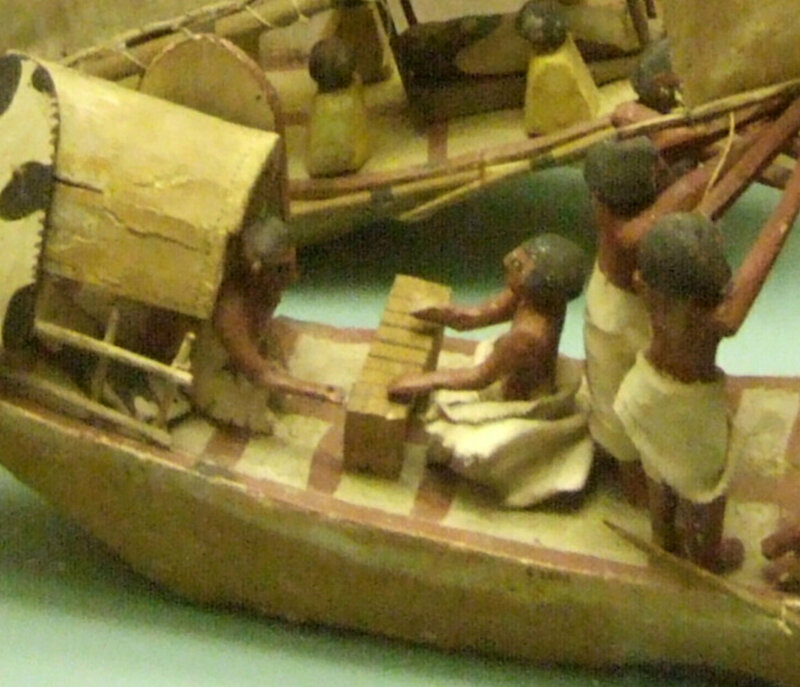 The game is a race game, which is consistent with all other ancient Egyptian games, although both players are racing in the opposite directions from each other. The white small pieces move only on narrow lines, and the black large pieces move only on wide lines. The goal of the game is a race to move the player’s pieces off the board first, off the opposite end. Pieces only move one at a time and do not move as a stack. Players can place multiple pieces on the same line. If a player places two or more pieces on the same line, it blocks the opponent’s pieces from crossing that line. If the opponent’s piece gets trapped between two player’s pieces on the lines before and after then the piece gets removed off the board and goes to the beginning of the game. Two pieces can only trap one opponent piece. So if the opponent has more than one piece on the same line, the other pieces are free to move forward unless the player places more of their own pieces on the lines before and after to trap them. The game is over when one player removes all of their own pieces off the board at the opposite end first which makes them the winner. Players can chose which pieces to move such that they can make a capture or a block. Crist, Walter, Anne-Elizabeth Dunn-Vaturi, and Alex de Voogt. Ancient Egyptians at Play: Board Games Across Borders. Bloomsbury Publishing, 2016. pp. 37-38. Bell, R. C. Board and Table Games from Many Civilizations. Courier Corporation, 2012. pp. 89-90. Williams, Bruce, and Keith Cedric Seele. The A-Group royal cemetery at Qustul: cemetery L. Vol. 3. Oriental Institute of the University of Chicago, 1986. Quibell, James Edward. Excavations at Saqqara:(1911-1912). The Tomb Of Hesy. Imprimerie de l’Institut Français d’Archéologie Oritentale, 1913. Verbeeck, Lieve (1998). “Bul: A Patolli game in Maya Lowland”. Board game studies: International Journal for the Study of Board Games. Leiden: Research School CNWS: 83–100. Culin, Robert Stewart. “Games of the North American Indians: Twenty-Fourth Annual Report of the Bureau of American Ethnology.” Smithsonian Institution, Washington (1907). pp. 141-143. Sapper, K. Spiele der K’ekchi Indianer. Anthropological Papers written in honor of Franz Boas: Boas Anniversary Volume. New York, 1906. pp. 283-289. I enjoy your blog very much. All ancient board games are race games, and all are symmetrical. Of course we have to assume that ‘men’ is a race game, played with a random generator. Apparently this is not what my colleagues (and friends) Walter Crist, Anne-Elizabeth Dunn-Vaturi and Alex de Voogt imply. Walter reminded me while in Athens (for the XXIst Board Game Studies Colloqiuum) that both mehen and men seem to be deprived of any ‘dice’. But your assumption, that the stick dice which are shown in the Tomb of Hesy (thank you for the colour picture! ), were used also with ‘men’ and ‘mehen’, may be correct. Maybe we can apply the same remark to ‘men’. If we have to adopt a scoring system — it seems you used the Tâb stick-dice scoring system – why not using it entirely and give a throw of all rounded a score of 6 as in most Tâb games? Also a throw of 1 may give the player a second turn (as in most Tâb games). Love your work. I agree with you that most probably the game was symmetric. My goal is not only to give a reconstruction, but also to give people a fun game to play, today, even if it’s not historically as accurate. So that’s why I decided to write both assymetrical and symmetrical versions. Do you have a translation of your article in English? Otherwise, I will have to use Google Translate, which is ok, but not preferable. Added your article to the Tab page. For any issues contact us at eli@ancientgames.org. Hey Buddy!, I found this information for you: "Men – The Game of 16 Lines". Here is the website link: https://www.ancientgames.org/men-the-game-of-16-lines/. Thank you.